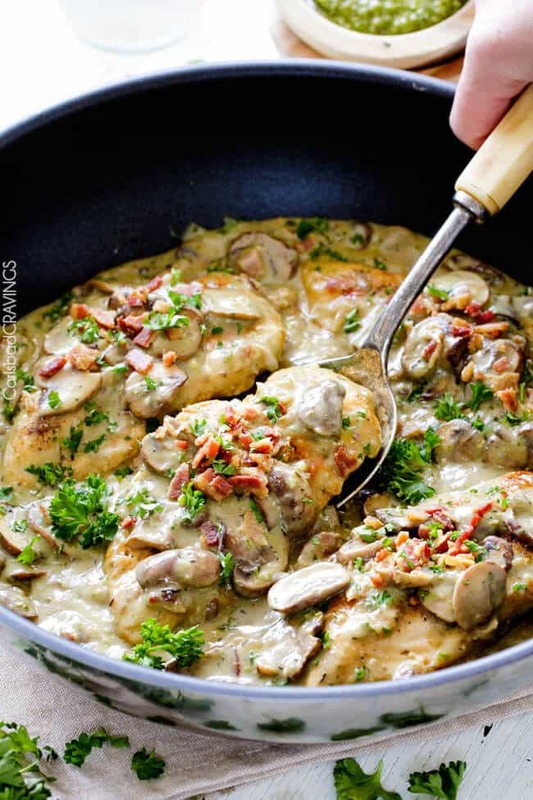 Lighter 30 Minute Chicken in Creamy Mushroom Sauce with Bacon and Pesto is one of the easiest yet most delicious chicken dinners you will ever make – and all in one skillet! Devour it alone or incredible with pasta, rice or potatoes, etc. 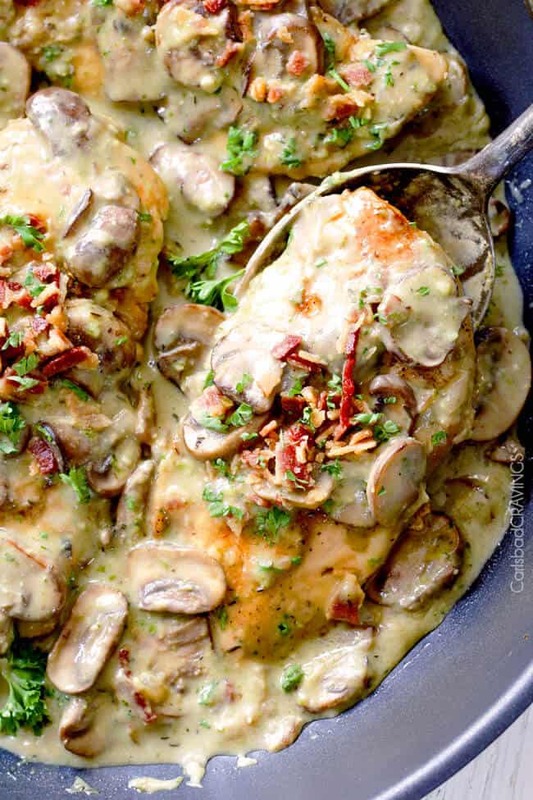 This Chicken in Creamy Mushroom Sauce really is so craving good, so elegant, yet simple, quick and easy all at the same time AKA you are going to fall in love with this chicken! I actually made this skillet twice in one week – which is quite a rarity being a food blogger because the only time I ever make something twice in such close succession is to either retest/perfect OR because it is so insanely delicious, I just need to relish all the flavors and creaminess one more time, and I need to now. It was the latter. Aaaand I knew it would only take me minutes and one skillet to whip up! 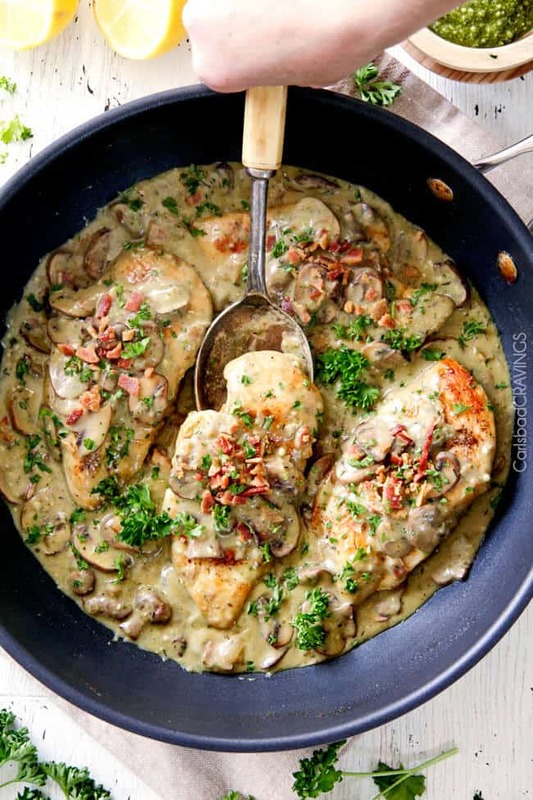 Now there are a lot of Chicken in Creamy Mushroom Sauces out there – but I promise this creamy mushroom bath has a depth of flavor you just won’t savor in the other dishes thanks to splashes of pesto, Dijon and balsamic – lick your plate delicious. 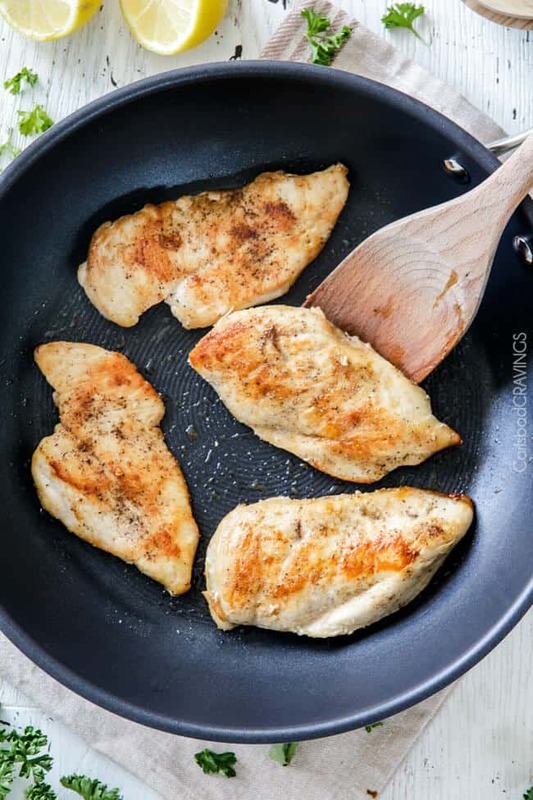 This easy chicken skillet starts with either slicing two larger chicken breasts in half horizontally or pounding 4 smaller chicken breasts thin and seasoning with salt and pepper then searing (they will cook more in the sauce) for super quick, moist, tender chicken. 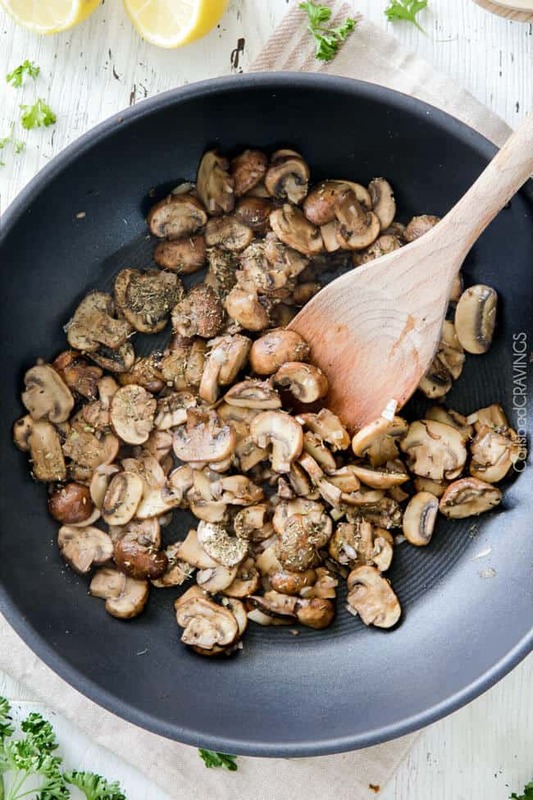 You then saute your mushrooms for a few minutes then add in some shallots, pesto, oregano and thyme and saute another few minutes and top off with some garlic. Can we say crazy flavorful mushrooms which means crazy flavorful sauce? Stir in some chicken broth, Dijon and balsamic along with some cornstarch to thicken, and the option of half and half or heavy cream. I have made this skillet both with and without the half and half/heavy cream (not using either) and it was absolutely divine each way. So if you are trying to cut some calories, then this can be a super lean meal with the omission of the cream. On the other hand, it is only 1/4 cup heavy cream so if you want to revel in extra creaminess, then add the cream. Totally up to you. Deciding what to do will be the hardest part of this dish. Stir in some bacon (also optional but totally recommended) then garnish with Parmesan cheese- now you are not going to want to skip the Parmesan – it transport this dish into other wordy deliciousness. And let’s eat! Chicken in Creamy Mushroom Sauce – an easy midweek meal or so delicious you’ll be making it twice a week. 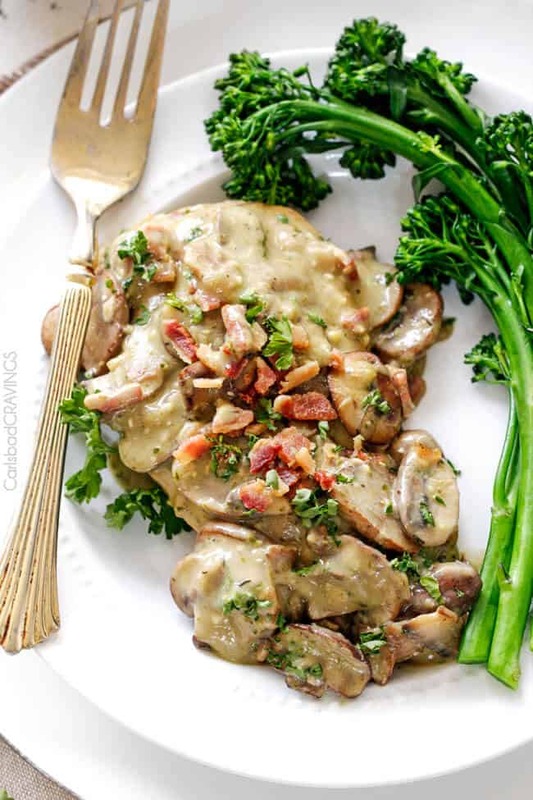 Want to try this 30 Minute Chicken in Creamy Mushroom Sauce? Pin it to your Chicken, Dinner or 30 Minute Meals Board to SAVE for later! Rinse and pat chicken dry then season with 1/2 teaspoon salt and 1/4 teaspoon pepper. Heat 1 tablespoon oil in large skillet over medium-high heat. Once very hot, add chicken and cook 2-3 minutes or until golden, flip, cover, and reduce heat to medium. Continue to cook 4-7 minutes (depending on thickness) or until chicken is cooked through. Transfer to plate. Reduce heat to medium and melt 1 tablespoon butter in 1 tablespoon olive oil. Add mushrooms, and cook, stirring often, for 4 minutes then add shallots, pesto, oregano and thyme and cook another 3 minutes, stirring often. Add garlic and saute 30 seconds. Stir in 1 1/2 cups chicken broth, cream or half and half (optional), Dijon mustard and balsamic vinegar. Whisk cornstarch with remaining 1/2 cup chicken broth and add to skillet. Bring to a boil then reduce to a simmer, stirring occasionally until sauce has thickened. Add chicken back to skillet, stir in half the bacon and leave the rest to garnish. Garnish with remaining bacon. freshly grated Parmesan (highly recommended) and fresh parsley. Serve with/over noodles, potatoes or rice. *This sauce is still wonderfully flavorful without the half and half/heavy cream so if you want to save calories you can definitely skip it – but if you want to add some extra creaminess, its divine! Can’t wait to try the chicken and mushroom sauce. Thank you so much Cara, I think you will love it, can’t wait tot hear what you think! Oh. MY , I cannot wait to try this! I might have to rearrange my menu to make this tonight – sounds delicious! I don’t care if it’s raining, I’m headed to the store. This looks like dinner! Jen you are amazing! My sister brought me your salsa verde honey lime chicken enchiladas right after I had a baby and I’ve been hooked to your recipes ever since! A couple of my favorites are the Stromboli YUM just made that last night and your pineapple ginger baked chicken- seriously better than restaurant quality. I look forward to trying many more of your recipes! Thank you!! Hi Mary, aren’t you the sweetest?! and thanks to your sister to introducing us to each other 🙂 I am so flattered you have been enjoying my recipes – we must be foodie taste bud kindred spirits! I love hearing what your favorite recipes are – you have very good taste 🙂 Thanks for saying hi and I hope you continue to have fun making and tasting! We are foodies and last night our son and his girlfriend came for dinner. My hubby was going to make chicken marsala, and then I showed him this! He made it, and oh, my! It is divine! Yum, yum, yum! Definitely a keeper recipe, thank you! He pounded the chicken breasts, he had to cut them as they were huge, and his turned out a bit stringy and chewy, so he thinks he overcooked them, which is rare for him, he is so good at making tender chicken breasts on the grill. So next time he is just going to use small chicken breasts, and not pound them. I could see this served over pasta or baked potatoes, there’s so much divine sauce! He mad lyonnaise potatoes, which were also so good. Ca’t wait to try more of your recipes! I Nancy, I love hearing that you opted for this recipe over Chicken Marsala and loved it, thank you! 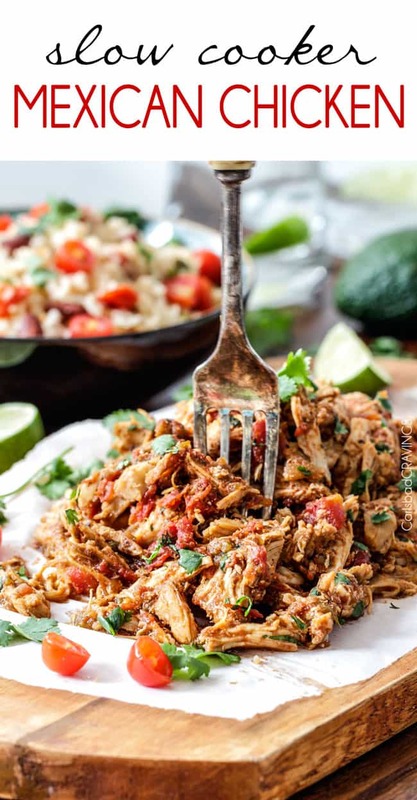 I feel like I cook for “foodies” who don’t mind a few extra ingredients if it means the food is going to come out more delicious – so I hope you have fun exploring and trying more of my recipes! I would love to try this recipe…..looks delicious! Do you think I could use some fresh basil instead of pesto? I don’t have enough basil to make pesto on hand. Thanks! Yes, fresh basil would be absolutely delicious!! I would add it toward the end of cooking – enjoy! This was an incredible recipe. I made it with the half/half and it tasted fabulous! Thank you, Jen! You are so welcome Kristen, so happy you loved it, thank you!! Wow! Had to modify the recipe somewhat as I only had chicken drumsticks on hand, but seriously yum. Sending this one to my son in Queensland too. 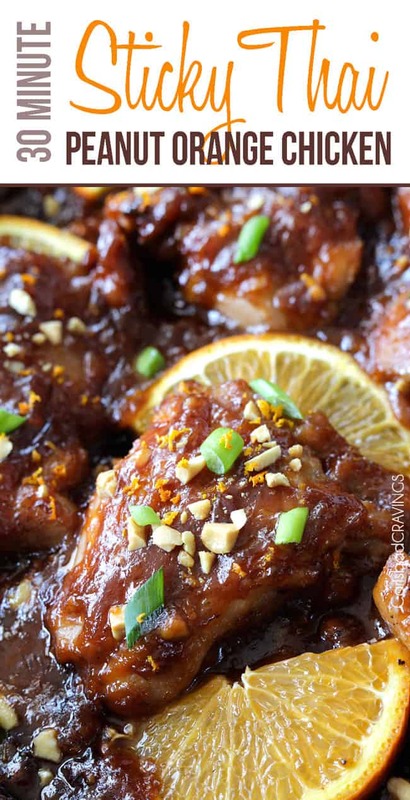 Love the idea of making this recipe with drumsticks – yum! I’m so glad you were able to modify the recipe successfully and it was hit enough to send it to your son! Thank you!! This was seriously amazing!! Jen you’re a genious. I’m so glad I happened to have all the ingredients in the refrigerator. I made it with brown rice and broccoli and the whole family loved it! Wow, thanks for another awesome recipe! The Dijon and balsamic vinegar was genius, totally elevated the sauce to a different level of depth with layers of complexity. Tasted like a complicated sauce taking hours to create, but was so simple. Where did you learn to cook like this, you’re definitely celebrity chef status!!! I’m just thankful for your website!!!! !